My children also like the barquillitos. They are small and more convenient to eat. 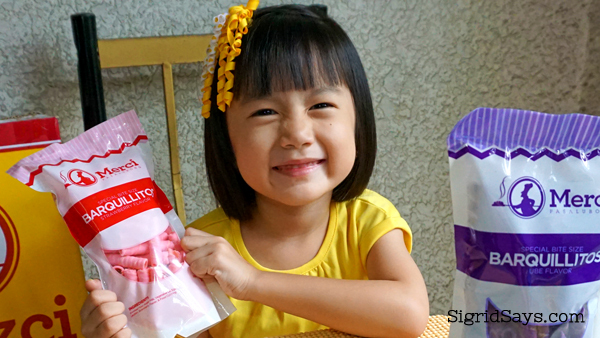 This little girl couldn’t wait for our 5-minute pictorial to be done so that she can already open a pack. Aside from our world-famous piaya flat cake, Bacolod City here in Negros Occidental, Philippines is also known for barquillos. 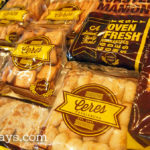 Barquillos are long rolled wafers that form cylinders. The cylinders can be from six inches to a foot in length. Some are thin and small while others have thick layers and are very long. The spin-off of the barquillos is the barquiron–which are rolled wafers stuffed with polvoron. The problem with barquillos is, it is very tedious to make. Skilled workers, usually men, face a hot griddle all day, pouring batter on it to form a thin layer, cook it for a few seconds, and then roll it into a steel rod. There should be precision in doing this, as the thin layers can get burned easily. It will turn brown and won’t roll that easily. I think that the production of barquillos is both a skill and an art. And I think it is slowly dying. 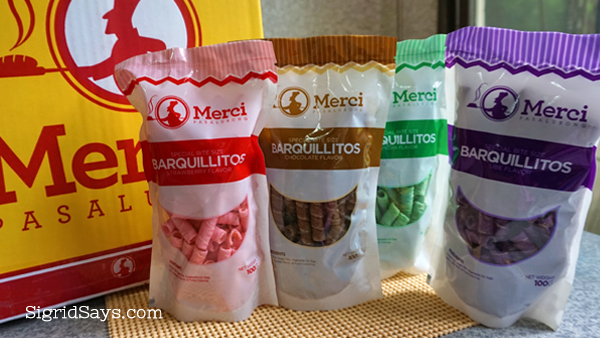 The second spin off of the barquillos at Merzci is the barquillitos. Based on the name, these are little versions of the barquillos. But while they are named that way, the barquillitos are made by a machine. The mix, I think, is altered a bit because they do not taste the same. 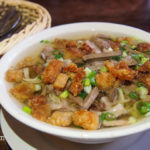 Nevertheless, barquillitos has its own flavor and character that have made them an endearing snack. 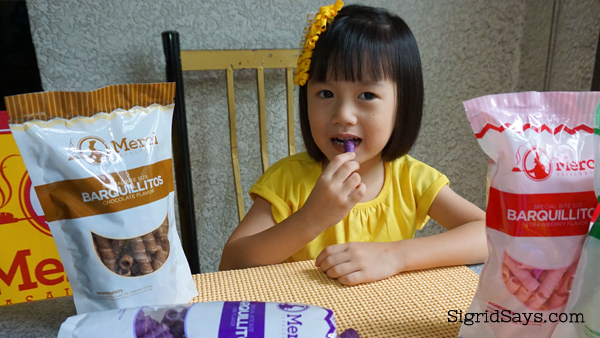 They are small and crunchy and easy to eat because you can easily put one piece inside your mouth. 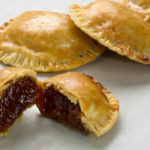 It is unlike the barquillos that kind of disintegrates with each bite, so you have to cup your hands under your mouth with each bite otherwise, most of them would end up on your lap. 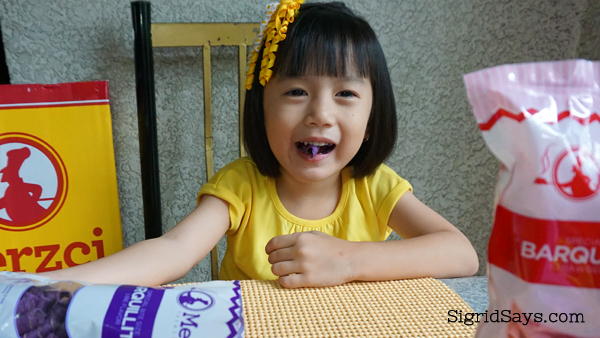 This kid chose to open the ube pack first, just because it’s purple. 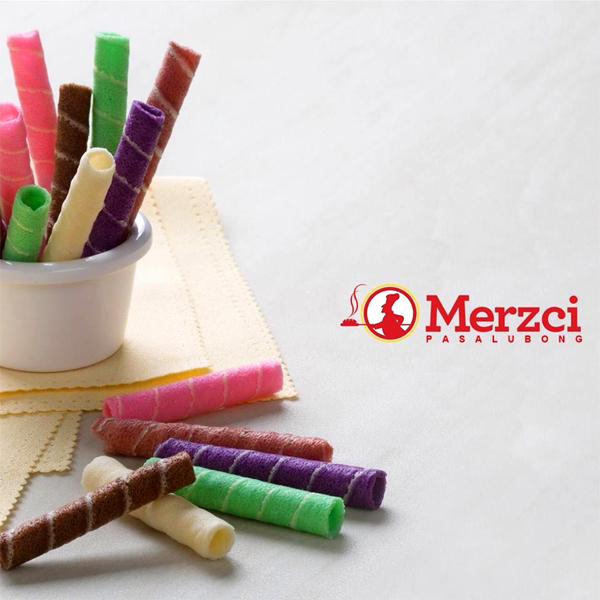 At Merzci Pasalubong, there are four flavors of the Barquillitos, namely ube (purple yam), strawberry (pink), pandan (green), and chocolate. They are sold in 100 gram packs and available in all their branches. 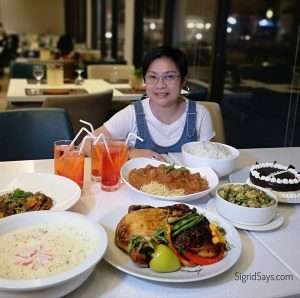 Check out the list of branches in Bacolod below. Just one click before she devours that stick. Packs of barquillitos. Include them with every box of Merzci pasalubong.